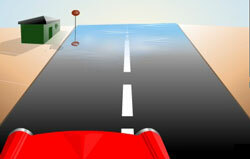 Sometimes while driving, why do we see water on the road when there is none ? This educational science animation explains this phenomenon on the basis of heating of air and total internal reflection of light. Useful for understanding optical densities, critical angle and refraction. What is a mirage ? Why do we perceive water when we see a mirage ? Why is a mirage formed ? What are the conditions for the TIR (Total Internal Refraction)? Why cool air is optically denser than the hot air? Why observer's brain concludes that only water body can produce such reflection of tree? Why light ray bends towards normal while traveling to a denser medium? A car moving on the road on a hot day will sometimes see a mirage of water lying on the road, the water seems to shift or disappear as the car nears it . Frequently, while driving along a highway on a clear, hot day, we see what appears to be pools of water some distance ahead. However, as we approach it, we find that the road surface that seemed wet before is actually dry. On looking ahead , the wet patch appears to have moved further away on the road. When the sun goes high in the sky, the road gets heated first and then the layers of air above it. Thus the layer of air closest to road is hottest and optically least dense whereas, the layers higher up are colder and optically more dense. The rays from the sky travel from an optically denser to a rarer medium and hence bend away from the normal. This bending continues and a stage is reached where the angle of incidence becomes greater than the critical angle and total internal reflection takes place. The totally reflected rays that reach the eyes appear to come from a point on the ground where the image of the sky is formed. Thus one sees a reflection of sky giving an illusion of water, though there is no water around. Ans: Classical ones are two image mirages, “inferior” has inverted image below, in “superior” one the image is above, three-image mirage are also seen, an inverted image lies between two erect ones. The top image is often strongly compressed. Mirages can have more number of distinct images. The kind of mirage seen depends upon the temperatures of different air layers. Sinking mirages appear when air temperature is warmer near the surface. While floating mirages form over frigid oceans or lakes.